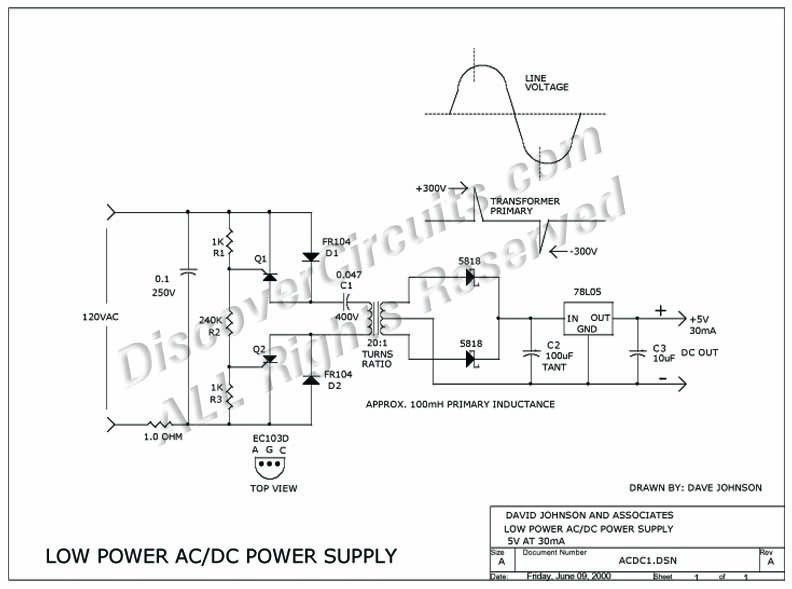 Circuit: MINIATURE ISOLATED AC/DC POWER SUPPLY __ Circuit designed by David A. Johnson, P.E. Often a low power circuit needs to be powered from the 120vac line. Usually, the circuit only needs a fraction of one watt and requires good isolation from the high voltage power line. The traditional circuit usually chosen is a classic linear regulator consisting of a small iron core transformer, a bridge rectifier, a filter capacitor and a voltage regulator. Although such a scheme provides the needed power and isolation, the assembly is seldom as inexpensive and as small as desired. The circuit shown below strives to keep both the size and cost of a line powered DC supply small.